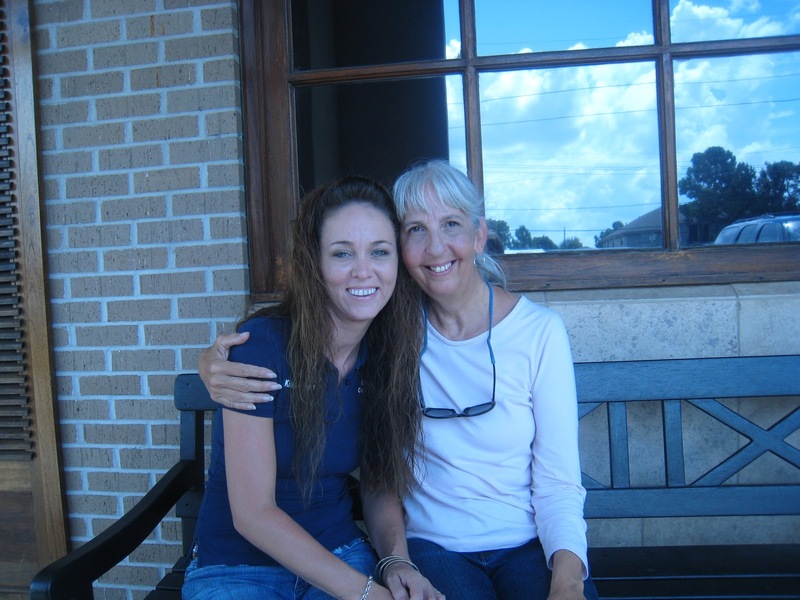 Usually when we see Kindra Arnesen, she’s speaking out for the people of her South Louisiana Parish – one of the hardest hit areas from the Deepwater Horizon Disaster. Yep, this pretty Cajun mama has taken them all on. It was priceless to see her get right up into Ken Feinberg’s face on the issue on why so many families in Plaquemine’s Parish have not yet received any payments from BP. And it brought a tear to my eye when she stood up in front of the White House last month, gettin’ down about how she and other Gulf families feel betrayed in light of the way they’ve been treated after Katrina, and now this. Here’s a short clip to give you a taste. Fasten your seatbelts! Kindra’s a great Mom, an amazing wife and now, by no choice of her own, a homegrown grassroots activist fighting tooth and nail for the people of the Gulf. And her voice has been heard around the world. After following Kindra on TV and YouTube for several months, I was a bit intimidated about meeting her. But this lady is ‘good to the bone’. After a couple of hours chatting with Kindra and her husband David, they felt like family. It’s true of Kindra, David, and so many other folks I’ve met in Louisiana. They’re the real deal. Imagine getting into a time machine and going back 150 years to a better time. When a handshake meant everything. People looked you in the eye and you could feel who they truly were. Their laughter came from the heart, without warning, often for no reason at all. It was when most people were just plain good. And did I mention? Strong. Really strong. Clearly the hardships these Bayou folks have had to endure have strengthened their characters. They are people of the sea. They have not led their lives glued to the TV and the Internet. They intrinsically understand what we have forgotten. With the world ocean in such jeopardy the tragic loss of many such fishing based cultures may be inevitable. Here, where the Mississippi Delta fans out into the Gulf of Mexico at almost no elevation at all, you can be 30 miles north of Venice and it feels just like you’re in the middle of the ocean in a boat. 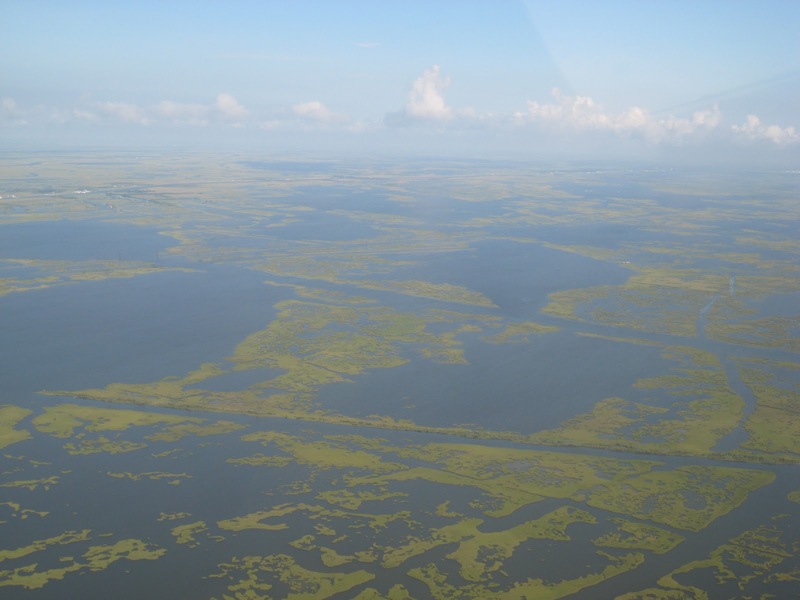 They live on this peninsula where the Mississippi river reclaims a football field of land every hour. The very existence of this delta takes billions of dollars a year to maintain. And just offshore, a gold mine in precious oil. 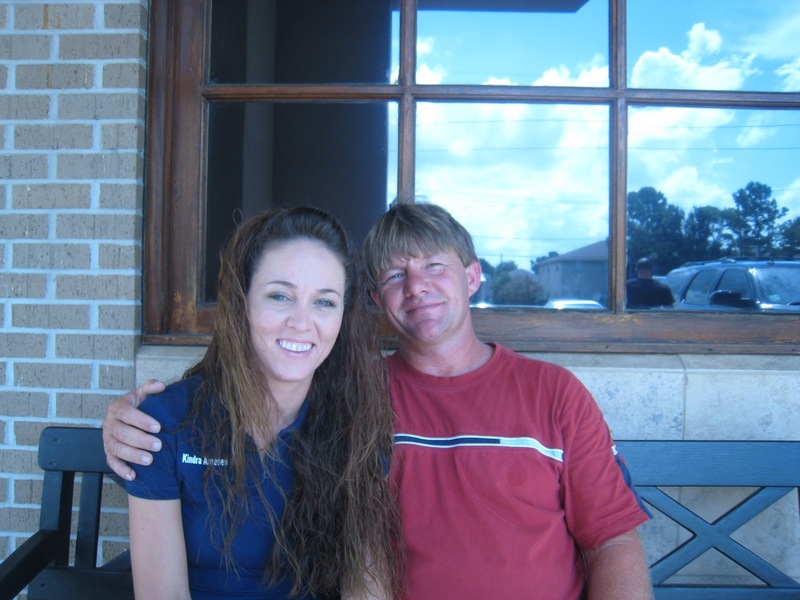 David, Kindra and their neighbors have been there from Day 1. And still the onslaught continues. Every day, the oil comes in with the tide. It spreads up into the marsh grass, coating it. Then heated by the sun, it melts and drips back down into the marsh. At night, they still spray their toxic dispersants. No, things are not OK in Plaquemine’s Parish. And they won’t be for a very long time. In this recent video, Kindra gives us the latest on public health (or the lack of it) in the Gulf. 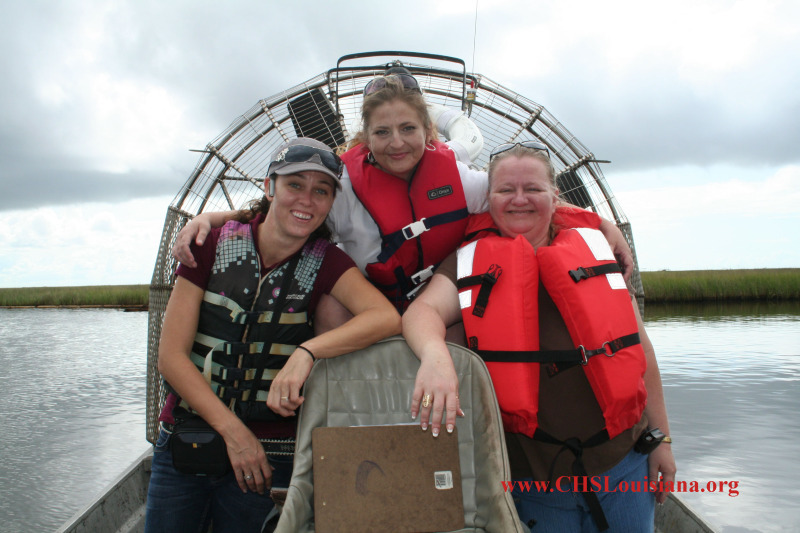 Kindra and her friends Joanie and Vicky of the Coastal Heritage Society of Louisiana are running ongoing fund drives for Gulf families. Imagine you’re a Gulf fisherman and your entire livelihood is gone. Many of these families have had no income since April. Now, they’re faced with having their electricity turned off, and making decisions as to whether they should be food or medicine for their kids. 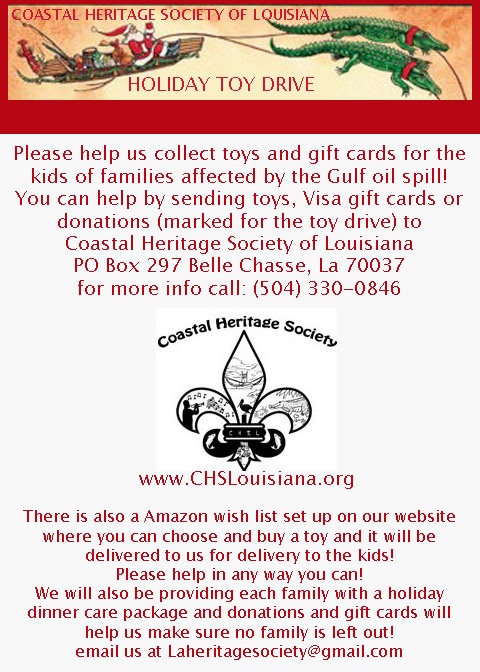 The Coastal Heritage Society’swebsite includes links to a kids wish list where you can buy toys through Amazon.com. It’s a snap and nothing feels quite as good as spreading a little Christmas cheer, right? It’s going to be a long hard road, but if anyone can win this war, it’s these folks. I feel it in my heart. >deb,i have just finished watching y'r video….i am soooo sorry all of u are going thu.i have been fighting this 'system ' for awhile,because i have been sick w/ cfs/me for 25 yrs +& "WE" are fighting it hard ! !when i saw y'r sores, oh my God,…u also have 'mersa'(& before i got sick, i was 30 yrs in the 'skin care-spa field') three months ago i 'helped' a fellow w/ it.i rec " http://www.guardiansilversol.com/ "What is Silver Sol? Silver sol is a remarkable new anti-microbial solution. It is composed of 0.001% elemental silver (10 parts per million) and 99.999% pure water. "Remarkably, silver sol has been shown to kill drug-resistant bacterial strains, to inhibit virus replication, and to provide other powerful health benefits. It can be safely applied topically or orally and has no known side-effects. Read on…"w/in 3 wk's the leasons, were gone,pus & all.he had to take 2tsp x2 @d & spray on wound,many times @ d / every time u can (now-here,they have the gel now)THIS, will be TO ALL OF U…A LIFE SAVER.ALSO….this was NOT done by acindent(sp-neuro probs) i will post a link to u, in regards to this," The Gov. is doing this ON PURPOSE ! (sadly 😦http://www.anthraxwar.com/1/&quot; Anthrax War is a ground-breaking feature length documentary which illuminates one of the most important stories of our age – the threat that a terrifying Germ War Arms Race may now be beginning around the globe…"i send ALL OF U, My Love, & Blessing's,marie moorelook me up on fb-i am in nc, & my pic is an angel.